Deliveries are made from ourselves, royal mail and our carefully chosen carriers (TNT etc). Smaller items (such as fixings / tapes etc if ordered individually) are usually posted out via royal mail first or second class post. Orders for smaller items are often dispatched same working day if ordered before 1:00pm. All of our smaller items are delivered free of charge with an option to upgrade to Royal Mail 1st Class from £3.99. Medium sized items and small items with a high value are delivered via a courier service such as Yodel, APC etc. Items are dispatched same working day if ordered before 1:00pm on an express service. Most items are delivered next working day. Tracking information is availabe for these services. This option is free of charge on most medium or high value small items. Deliveries of large items (polycarbonate / glazing bars etc) are made via specialist transport services or carriers such as specialist transport companies, TNT, Tuffnells etc. Deliveries are dispatched within one working day and delivery is generally made within 5 working days however dependant upon location deliveries may sometimes take longer. We will contact you shortly after you have placed your order to let you know when your order can be delivered. This option is standard on all orders for large items and is charged at £18.00 irrelavent of the quantity or size of product ordered. Please be aware our standard delivery time of 'up to 5 working days' is an estimate and deliveries may take slightly longer dependant upon location and size of items ordered. Please note: Most of the large items we deliver are too big for the 'normal couriers' i.e. Yodel, Parcelforce, DPD etc. this means that in some circumstances the lead times for orders may be extended dependant upon location. All deliveries made from ourselves, or carriers delivering on our behalf are available to Mainland United Kingdom ONLY. Please contact us if you require deliveries to other areas of the UK. Certain areas of the Highlands of Scotland and Mid Wales also carry a delivery surcharge and/or are subject to extended lead times. ALL deliveries are made Monday - Friday ONLY (we do not offer weekend or bank holiday deliveries). On orders for polycarbonate, glazing bars, corruagted sheets and evolution canopies we will contact you after you have placed your order via telephone or email to arrange a delivery date. Please provide us with up to date telephone contact details and an up to date email address at the time of your purchase. 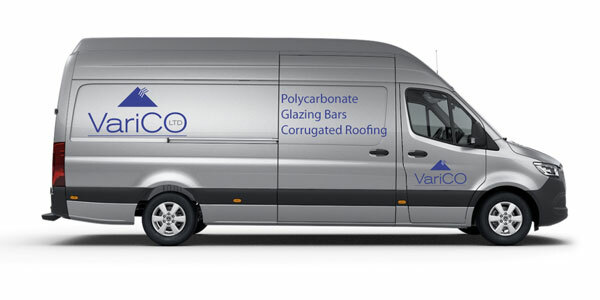 Please note: ALL polycarbonate, glazing bars, corrugated PVC sheet, corrugated bitumen sheet and canopies may require a signature upon delivery however unless specifically requested in writing from the purchaser at the time of order goods may be left in safe place by the delivery company. If you DO NOT want goods to be left without a signature you must inform us at the point of ordering. As most of the deliveries are made by one delivery driver, sometimes with deliveries of larger items you may be required to help the driver with the unloading of the material. Unfortunately sometimes goods do get damaged in transit. If goods appear to be damaged on delivery please ensure that you sign the paperwork 'DAMAGED' as claims for damaged goods cannot always be accepted if the paperwork has been signed as received (in good condition). Signing 'unchecked' is not acceptable method of signing the delivery note. Please see our terms and conditions for more information concerning damaged material found here. Should you have a specific request concerning your delivery we will do our best to accommodate you. Please contact us if you require any help or have any specific requests. Free delivery is available on selected items only. Items include multiwall polycarbonate sheet in 10mm, 16mm, 25mm & 35mm thicknesses, glazing bars, glazing bar accessories and corrugated PVC sheets only. The delivery charge is deducted at checkout automatically once the minimum (£250.00 nett) threshold has been reached. The minimum spend to get free delivery is £250 for all items ordered together for delivery together. We cannot refund any delivery charges for orders not placed together. Free delivery applies only to our standard delivery of up to five working days. Please note: the free delivery promotion maybe withdrawn at any time.